This page is about building prompts. Pieces of code that we can embed in a program for asking the user for input. Even if you want to use prompt_toolkit for building full screen terminal applications, it is probably still a good idea to read this first, before heading to the building full screen applications page. In this page, we will cover autocompletion, syntax highlighting, key bindings, and so on. What we get here is a simple prompt that supports the Emacs key bindings like readline, but further nothing special. However, prompt() has a lot of configuration options. In the following sections, we will discover all these parameters. Instead of calling the prompt() function, it’s also possible to create a PromptSession instance followed by calling its prompt() method for every input call. This creates a kind of an input session. # Do multiple input calls. The input history will be kept between consecutive prompt() calls. The PromptSession() instance and its prompt() method take about the same arguments, like all the options described below (highlighting, completion, etc…). So if you want to ask for multiple inputs, but each input call needs about the same arguments, they can be passed to the PromptSession() instance as well, and they can be overridden by passing values to the prompt() method. Adding syntax highlighting is as simple as adding a lexer. All of the Pygments lexers can be used after wrapping them in a PygmentsLexer. It is also possible to create a custom lexer by implementing the Lexer abstract base class. We pass include_default_pygments_style=False, because otherwise, both styles will be merged, possibly giving slightly different colors in the outcome for cases where where our custom Pygments style doesn’t specify a color. The roman , sans , mono and border options are ignored. The style has a few additions: blink, noblink, reverse and noreverse. 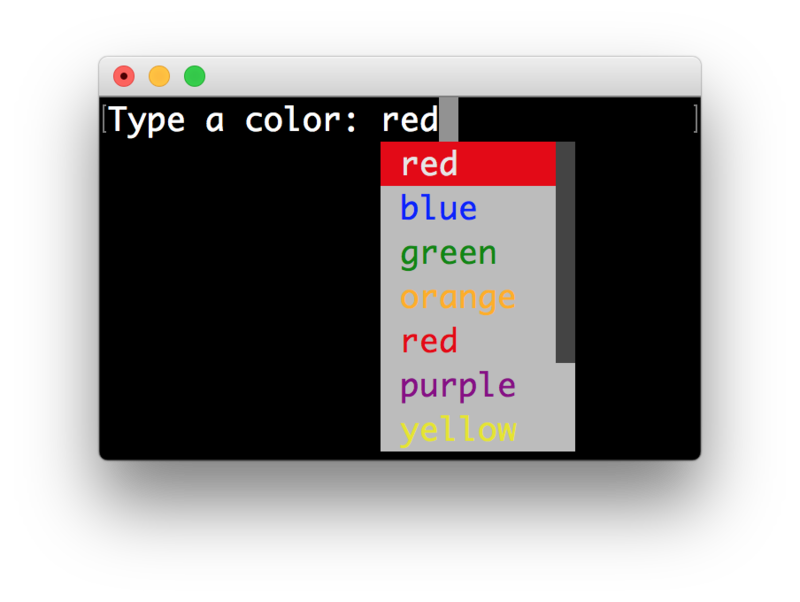 Colors can be in the #ff0000 format, but they can be one of the built-in ANSI color names as well. In that case, they map directly to the 16 color palette of the terminal. All Pygments style classes can be used as well, when they are wrapped through style_from_pygments_cls(). It is possible to add some colors to the prompt itself. For this, we need to build some formatted text. One way of doing is is by creating a list of style/text tuples. In the following example, we use class names to refer to the style. # User input (default text). The message can be any kind of formatted text, as discussed here. It can also be a callable that returns some formatted text. By default, colors are taking from the 256 color palette. If you want to have 24bit true color, this is possible by adding the true_color=True option to the prompt() function. Autocompletion can be added by passing a completer parameter. This should be an instance of the Completer abstract base class. WordCompleter is an example of a completer that implements that interface. WordCompleter is a simple completer that completes the last word before the cursor with any of the given words. Note that in prompt_toolkit 2.0, the auto completion became synchronous. This means that if it takes a long time to compute the completions, that this will block the event loop and the input processing. For heavy completion algorithms, it is recommended to wrap the completer in a ThreadedCompleter in order to run it in a background thread. A Completer class has to implement a generator named get_completions() that takes a Document and yields the current Completion instances. Each completion contains a portion of text, and a position. The position is used for fixing text before the cursor. Pressing the tab key could for instance turn parts of the input from lowercase to uppercase. This makes sense for a case insensitive completer. Or in case of a fuzzy completion, it could fix typos. When start_position is something negative, this amount of characters will be deleted and replaced. Each completion can provide a custom style, which is used when it is rendered in the completion menu or toolbar. This is possible by passing a style to each Completion instance. # Display this completion, black on yellow. # Specify class name, which will be looked up in the style sheet. Notice that this setting is incompatible with the enable_history_search option. The reason for this is that the up and down key bindings would conflict otherwise. So, make sure to disable history search for this. When generating the completions takes a lot of time, it’s better to do this in a background thread. This is possible by wrapping the completer in a ThreadedCompleter, but also by passing the complete_in_thread=True argument. A prompt can have a validator attached. This is some code that will check whether the given input is acceptable and it will only return it if that’s the case. Otherwise it will show an error message and move the cursor to a given position. A validator should implements the Validator abstract base class. This requires only one method, named validate that takes a Document as input and raises ValidationError when the validation fails. # Get index of fist non numeric character. # We want to move the cursor here. If the input validation contains some heavy CPU intensive code, but you don’t want to block the event loop, then it’s recommended to wrap the validator class in a ThreadedValidator. We define a function that takes a string, and tells whether it’s valid input or not by returning a boolean. from_callable() turns that into a Validator instance. Notice that setting the cursor position is not possible this way. A History object keeps track of all the previously entered strings, so that the up-arrow can reveal previously entered items. Auto suggestion is a way to propose some input completions to the user like the fish shell. Usually, the input is compared to the history and when there is another entry starting with the given text, the completion will be shown as gray text behind the current input. Pressing the right arrow → or c-e will insert this suggestion, alt-f will insert the first word of the suggestion. When suggestions are based on the history, don’t forget to share one History object between consecutive prompt() calls. Using a PromptSession does this for you. A suggestion does not have to come from the history. Any implementation of the AutoSuggest abstract base class can be passed as an argument. Adding a bottom toolbar is as easy as passing a bottom_toolbar argument to prompt(). This argument be either plain text, formatted text or a callable that returns plain or formatted text. When a function is given, it will be called every time the prompt is rendered, so the bottom toolbar can be used to display dynamic information. The toolbar is always erased when the prompt returns. Here we have an example of a callable that returns an HTML object. By default, the toolbar has the reversed style, which is why we are setting the background instead of the foreground. Similar, we could use a list of style/text tuples. The default class name is bottom-toolbar and that will also be used to fill the background of the toolbar. The prompt() function has out of the box support for right prompts as well. People familiar to ZSH could recognise this as the RPROMPT option. So, similar to adding a bottom toolbar, we can pass an rprompt argument. This can be either plain text, formatted text or a callable which returns either. The get_rprompt function can return any kind of formatted text such as HTML. 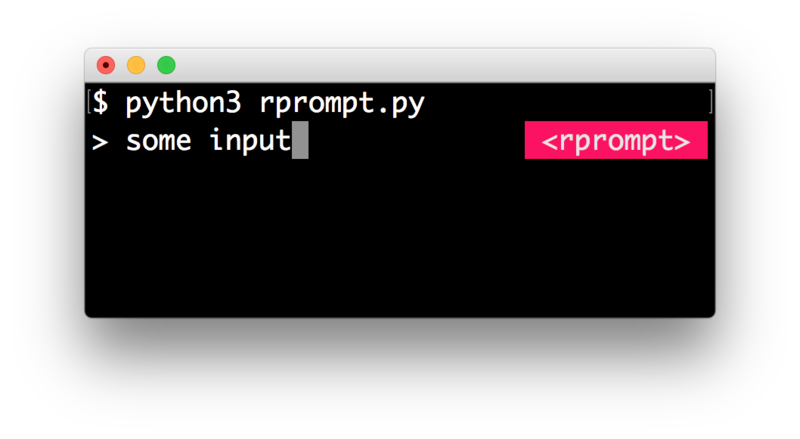 it is also possible to pass text directly to the rprompt argument of the prompt() function. It does not have to be a callable. Prompt-toolkit supports both Emacs and Vi key bindings, similar to Readline. The prompt() function will use Emacs bindings by default. This is done because on most operating systems, also the Bash shell uses Emacs bindings by default, and that is more intuitive. If however, Vi binding are required, just pass vi_mode=True. By default, every prompt already has a set of key bindings which implements the usual Vi or Emacs behaviour. We can extend this by passing another KeyBindings instance to the key_bindings argument of the prompt() function or the PromptSession class. An example of a prompt that prints 'hello world' when Control-T is pressed.
" 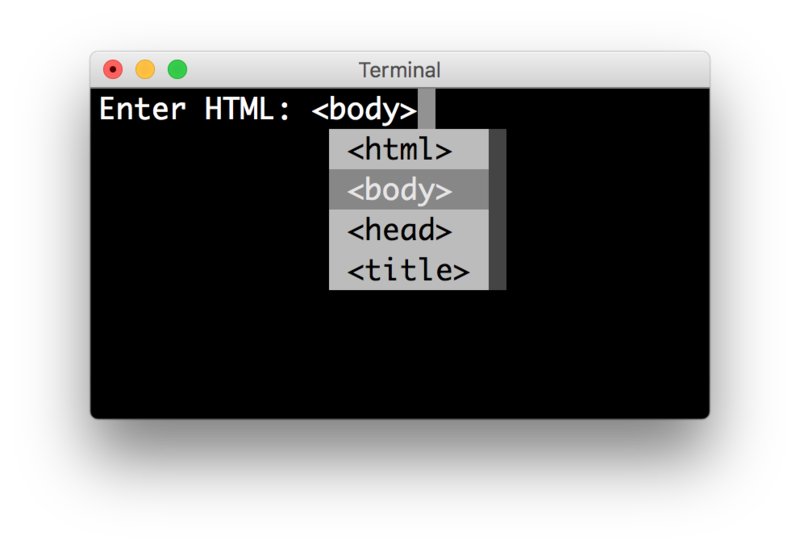 Say 'hello' when `c-t` is pressed. " " Exit when `c-x` is pressed. " Note that we use run_in_terminal() for the first key binding. This ensures that the output of the print-statement and the prompt don’t mix up. If the key bindings doesn’t print anything, then it can be handled directly without nesting functions. Often, some key bindings can be enabled or disabled according to a certain condition. For instance, the Emacs and Vi bindings will never be active at the same time, but it is possible to switch between Emacs and Vi bindings at run time. The Application has an editing_mode attribute. We can change the key bindings by changing this attribute from EditingMode.VI to EditingMode.EMACS. # Create a set of key bindings. # Add an additional key binding for toggling this flag.
" Toggle between Emacs and Vi mode. " # Add a toolbar at the bottom to display the current input mode.
" Display the current input mode. " An popular short cut that people sometimes use it to use control-space for opening the autocompletion menu instead of the tab key. This can be done with the following key binding.
" Initialize autocompletion, or select the next completion. " 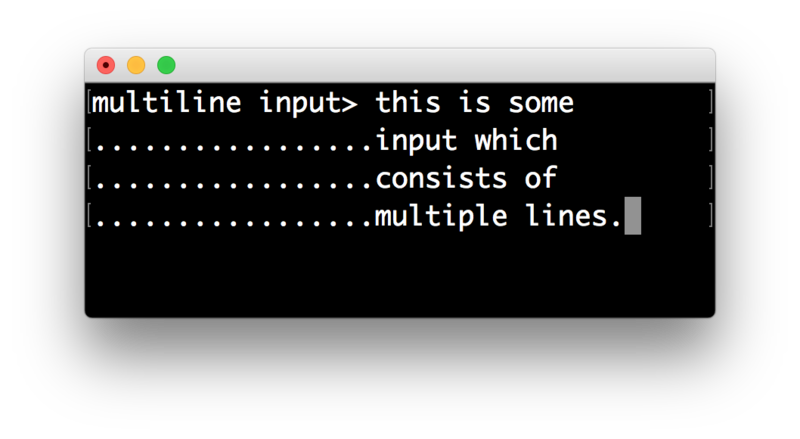 Reading multiline input is as easy as passing the multiline=True parameter. There is limited mouse support for positioning the cursor, for scrolling (in case of large multiline inputs) and for clicking in the autocompletion menu. Enabling can be done by passing the mouse_support=True option. Line wrapping is enabled by default. This is what most people are used to and this is what GNU Readline does. When it is disabled, the input string will scroll horizontally. When the is_password=True flag has been given, the input is replaced by asterisks (* characters). The answer is to run the prompt_toolkit interface on top of the asyncio event loop. First we have to tell prompt_toolkit to use the asyncio event loop. Then prompting the user for input is as simple as calling prompt() with the async_=True argument. # Tell prompt_toolkit to use the asyncio event loop. The patch_stdout() context manager is optional, but it’s recommended, because other coroutines could print to stdout. This ensures that other output won’t destroy the prompt.